Touring a wine region (what we in the USA call “Wine Country”) is tremendously enjoyable, but it can also provide a superb education in wine and an opportunity to learn about agriculture, grape growing, and how wine is made, bottled, aged and sold. Americans often think of “wine country” solely as Napa and Sonoma valleys, but in fact there are many wine regions in California alone. While not precisely parallel to Wine Appellations in Europe, American Viticultural Areas (AVAs) are regions that purportedly enjoy distinctions in terms of climate, soil, elevation, and other factors. And, wineries may use AVA names on their labels if at least 85% of the grapes used to make the wine were grown within the named AVA. Click on the link above from The Wine Institute to learn more…it’s from their own “Wiki,” not Wikipedia, so you can be sure the writers and editors are authentic. Now there’s more than a little controversy among wine producers, grape growers and wine aficionados as to whether AVAs really mean anything. One reasonable point of view is that they are simply effective marketing tools, and they are, to be sure. This perception stems from a number of reasons, not least of all because AVAs can be tiny, such as California’s Cole Ranch, about 150 acres, all the way to the Ohio River Valley AVA – 16,640,000 acres across four states! Critics here say, just as reasonably, that such an area cannot have any singularly distinctive features…and it’s hard to aruge with that logic. In any event, though, it’s beneficial to learn about AVAs as well as European Wine Appellations, and I’ve written a bit about those here. Before you take off for wine country, it’s a good idea to do some homework. For example, map out two to three wineries each day that you’d like to visit. Two means a leisurely day with lots of time for lunch, and three is about the limit if you really want to enjoy yourself and not be too rushed – or drink too much. And you need time to get from place to place; in Napa for example, you can get from one winery to another by walking across Rt. 29 (be careful!) or driving another 500 yards up the Silverado Trail. But in sprawling Sonoma, to go from a particular winery in the south, say, Ravenswood in Sonoma Town, to another in the north, say, Pedroncelli in Geyserville, could take you an hour and a half. Check out your winery targets on the internet – virtually all have web sites – and determine where you’ll start and finish your tour each day. Most California wineries are open from 11 am to 5 pm, although some open until 6 pm, and a few close as early as 4 or 4:30 pm. By contrast, most wineries in New York’s Hudson Valley and Finger Lakes are closed for several months each year, although a few are open during the winter on weekends and by appointment. On a different note, there are some very tiny, boutique operations, typically producing under 1000 cases a year, whose wineries are really the basements of private homes. 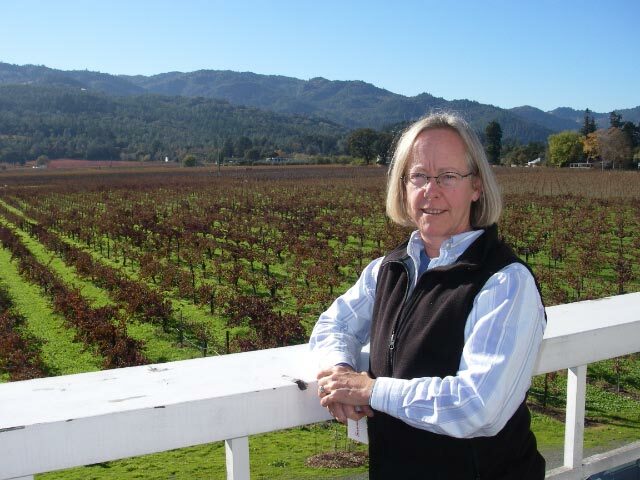 One such boutique winery, Allora Vineyards, produces some of the best Cabernet I’ve ever tasted, and its owner, Terry Klein, hosted me in 2005 for one of the most enjoyable wine visits I’ve ever made. Allora is admittedly not typical, with Terry handling the winemaking and his lovely daughter Kelly, the marketing and sales, but a refreshing change from large commercial wineries. You can see some great photos from Allora on my home page. Anyway, when planning, consider the types of wine that you’d like to taste, or wines whose names you know. But also consider visiting wineries that specialize in wines that you haven’t tasted – broaden your horizons! For some suggestions, click here. For example, if you are a dyed-in-the-wool Chardonnay fan, as so many people are, find a winery that makes a great dry Riesling, a Viognier or a crisp Sauvignon Blanc. 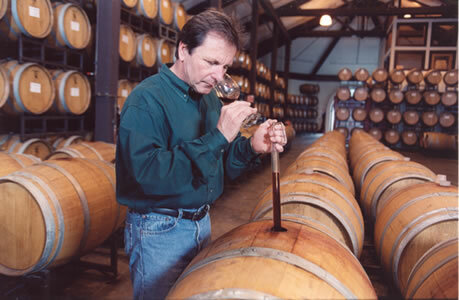 Or even a winery such as Kunde, that produces Chardonnay with no malolactic fermentation (the process of changing zesty malic acid to softer lactic acid). And if you are a Cabernet or Pinot Noir cowboy, expand your horizons and check out a winery that does a Malbec or Petit Verdot as varietals. Many wineries offer tours, which can range from a 5-minute walk through a barrel room, to an elaborate hour or more including time in a vineyard and in the crush, fermentation and bottling areas. Domaine Chandon in Napa, for example, has a great tour and you can often see the bottling line in action. And sometimes it’s possible to meet the winemaker him- or herself, and these are the closest thing that the wine world has to rock stars. Kathy Corison of Corison Winery, shown at right, would deny that, but I’ve tasted her wine, and I’m keeping a bottle of her ’97 for another ten years, although I can hardly wait. If you’d like to meet a winemaker, do call ahead and ask. But don’t plan to meet anyone but the tasting room staff during August, September and October (and maybe even November) during the harvest and crush…those folks are just too busy. In any event, you can also ask if the winery has a “wine library,” usually an elegantly-appointed cellar where they hold “VIP” tastings, and where you might get a taste of some more prestigious or rare wines, or older vintages. 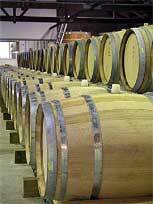 If you want to really appreciate the winemaking process, ask if you can do a barrel tasting of young wine that hasn’t been bottled and released and is still aging. 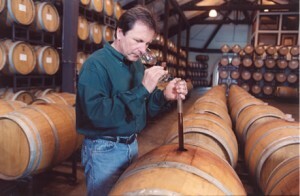 Here you see winemaker Bill Anderson of Chateau Julien Wine Estate in Carmel, California tasting from a barrel using a wine thief, a long, curved glass tube. It’s lots of fun, and if your host is game, you too will be tasting young, sometimes rough wine and spitting on the floor with the best of the cellar crew. And, keep in mind that many wineries offer a similar experience, and once you’ve seen 20 grape hoppers, crusher-destemmers, bladder presses, and stainless steel fermentation tanks with pump-over, you’ve seen them all. 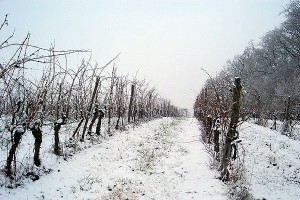 Instead, focus your eyes and your attention whenever possible, on the vineyards…it is there that wine is really born. So even if your hosts don’t offer a vineyard tour, you might discreetly and respectfully walk out among the vines, perhaps with a glass in hand, and spend a few minutes appreciating that a winery is really just agriculture, and that wine is a living thing, from a living thing.